These days, there seem to be so many classes offering to help your child do better and achieve more. 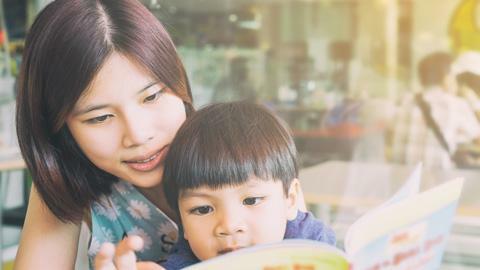 But according to psychologist-educator Dr. Queena Lee-Chua, the home is still the best place to learn—and you are the best teacher to make sure your child grows up to be well-rounded. So what does it mean when your child is well-rounded? Read on below. 1. He’s sociable because he understands others. Sociability, or the inclination to seek companionship, is a key component to forming healthy relationships with the rest of society. And for child to be sociable, he must start by possessing empathy, or the ability to understand others or share their feelings. When kids can understand and more importantly, relate to others, they can communicate more, form more social connections to their peers, and even build initial relationships that teach them how to build more long-lasting ones in the future; all key components to a happier, more successful life in the future. You can help your child be more sociable by interacting with him constantly and encouraging him to interact with others as well. 2. He’s creative without fear. It’s easy to take playtime for granted, but for kids, it’s not just about fun. All those times you helped your child build a fort or watched him and his friends pretend to be knights are actually learning moments. They teach your child to run through situations in his mind, take more risks, and even anticipate how his efforts will delight others. So encourage playtime and creative playfulness. In fact, show your child how you can be creative during playtime, so he can see that it’s okay to try new things, even when they don’t work out at first. This quality can help your child think big without fear well into his adulthood. 3. He’s smart, but he doesn’t bask in it. From an early age, kids are taught to value intelligence. But how they see it makes the difference in how they learn. More than three decades of research show that kids who are often praised for being “so smart” may eventually think that intellect is innate and fixed. They may end up believing that putting effort in learning is a sign of low ability –and that looking smart is in fact more important. Because of that, they become afraid of mistakes and challenges, seeing them as threats to their ego. One pitfall is when kids turn to rote memorization of facts, instead of searching for a true understanding of the lesson at hand. After all, if the only measure of success is knowing the right answer, why should kids aspire for the proper understanding and application of these lessons? In contrast, kids who are praised for their efforts and strategies, are taught the value of hard work, and have the love of learning instilled in them become more open to exploring and learning. They see mistakes as opportunities for growth and persist despite failure. That means they learn more, because they learn all the ways they shouldn’t do it. In the end, what counts is how you help your child grow up to be sociable, creative, and smart. Coupled with proper nutrition, you can help make him more well-rounded for more learning.